Our common enemy is disease. Yet, there are three kinds of lies in healthcare: lies, damn lies, and medical statistics. * Partly because of this, and partly because of the difficult mathematics, there is an 88% health illiteracy rate (Health.gov) among patients. We can also solve health illiteracy with Treatment Scores. *There are three kinds of lies: lies, damn lies, and statistics. - is sometimes credited to Benjamin Disraeli or Mark Twain. We put a slant on the sentence by using medical statistics instead of statistics. You must consult your own licensed physician, or other licensed medical professional, for diagnosis, treatment, and for the interpretation of all medical statistics including Treatment Scores. Treatment Scores are for informational purposes only. Treatment Scores may be incomplete, inaccurate, harmful, or even cause death if used for treatment instead of consulting a licensed medical professional. No medical advice is being given. We DO NOT CLAIM to cure, treat, or prevent any illness or condition. 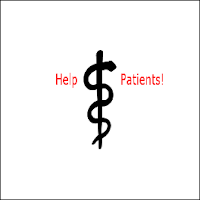 Nor do our services provide medical advice or constitute a physician patient relationship. Contact a physician or other medical professional if you suspect that you are ill. Call emergency services (call 911 if available) or go to the nearest emergency room if an emergency is suspected. We are not responsible for any delays in care from using our website, our services, or for any other reason. We are not responsible for any consequential damages of any nature whatsoever. We make no warranties of any kind in connection with our writings or the use of TreatmentScoresBlog.com or TreatmentScores.com. Treatment Scores are about what happened to patients studied in the past; they do not predict the future. Copyright © 2018 Treatment Scores, Inc. All Rights Reserved. I’m scared to death of pancreatic cancer. Celebrities like Patrick Swayze (Dirty Dancing) and astronaut Sally Ride have died from pancreatic cancer. Overall, only 1% of patients live for 10 years after being diagnosed with pancreatic cancer. Many friends of friends have died from pancreatic cancer. I hate pancreatic cancer. It's emotionally devastating. When you get sick you need a list of treatments, and you need to know the “net treatment benefit” for each treatment (as summarized from existing medical studies). You would think it would be easy to get the “net treatment benefit” for a medical treatment, but in fact it’s nearly impossible, because the statistics are so disorganized. Also, many medical studies do not have a “control group” that compares treatment versus no treatment, or treatment versus placebo, or treatment vs. sham surgery. There are two main kinds of pancreatic cancer, “neuroendocrine” and “adenocarcinoma.” Neuroendocrine is less common and less lethal. There is hope. The American Cancer Society reports that even patients with stage 4, neuroendocrine, pancreatic cancer, who did not have surgery, had a 5-year survival rate of 16%. Stage 1, 2, and 3 are considered less lethal. I decided to focus this essay on the most curable type of pancreatic cancer, stage 1, neuroendocrine, pancreatic cancer. Stage 1 is a small cancer localized to the pancreas, and in many studies the 5-year survival is over 50% for these particular patients. Allegedly, Steve Jobs had “stage 1 neuroendocrine pancreatic cancer.” My apologies to Steve Job’s family and friends. May he rest in peace. I have no inside information about his case, but am using what has been reported in the media, which may or may not be accurate, for learning purposes. Let’s say that I am diagnosed with pancreatic cancer, neuroendocrine, stage 1. Obviously, I would want to know how much each treatment would increase my 5-year survival. I call “the net treatment benefit as summarized from the medical literature” the Treatment Score. I need a list of treatments and Treatment Scores. (See disclaimers below). Treatment Scores would fit easily on your smart phone. In the graphic, I gave surgery a Treatment Score of 10%. I gave the chemotherapy, Gemzar® (gemcitabine), a Treatment Scores of 0%. And, I also scored many other treatments, which I will discuss. Net income = gross income – expenses. 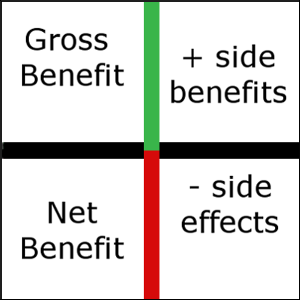 Gross Benefit + side benefits – side effects = Net Benefit. Follow the graphic in a clockwise direction to get to go from the Gross Benefit to the Net Benefit. Simple right? No! Figuring out the “net treatment benefit” is anything but simple, it’s complicated. It’s damn near impossible, but it shouldn’t be. Your life is at stake and your health is at risk. What could be more important? Part of what is so difficult is that the side effects are almost all on different scales. For example, if there is a 20% rate of “delayed gastric emptying” (stomach paralysis) from surgery, you have to convert that side effect onto the 5-year survival scale before subtracting it. That means you must “weight” the side effect and convert it. You must “weight” all the side effects and convert all of them. It’s like converting your expenses in Euros, and your expenses in Pesos, etc. into US dollars, and then subtracting them to figure out your total income in US dollars. Much of what we might know about Steve Jobs, the former CEO of Apple, and pancreatic cancer comes from the Walter Isaacson authorized biography, Steve Jobs, published in 2012. Many great articles were inspired by Steve Job’s death (and his biography) which are worth reading. Steve Jobs was diagnosed with pancreatic cancer in October, 2003. Steve Jobs had surgery July, 2004. Steve Jobs had a liver transplant in 2009. Steve Jobs died in 2011. According to the New York Times it was a vegan diet. Steve Jobs may have tried acupuncture, hydrotherapy, and various other treatments. After his death, one physician, Dr. Robert Wascher, MD, suggested that Jobs should have tried turmeric (a spice) as a treatment. The Whipple procedure is so dangerous that in the past 25% of patients used to die from the operation alone. Surgeons actually “brag” (as they should) in the medical literature about doing a series of surgeries without killing any patients. German surgeons operated on 118 patients in row without any deaths. Japanese physicians (Hiroshima) did 150 surgeries in row without any deaths. Australian physicians did 178 in a row without any deaths. Brazilian physicians did 214 in a row without any deaths. Japanese physicians (Tokyo) did 368 in a row without any deaths. As mentioned earlier, I gave surgery a Treatment Score of 10% as an increase in 5-year survival. It was incredibly hard to come up with a reasonable number, because the studies typically being cited are case-series studies without any controls. Stage 1, neuroendocrine, pancreatic cancer is the least lethal type, and many patients, even most patients, may live for 5 years without surgery. The range for the Treatment Score of 10% is large, because there are no controls and not enough patients (which in the future we will show with animations). Here is the background data that has to be converted and subtracted. It's main outcome - side effects = Treatment Score. You will be able to see all this, and more, on your smart phone. When I started this project, I expected that surgery vs. no surgery would be a slam dunk. I thought surgery for stage 1, neuroendocrine, pancreatic cancer was wildly successful, nearly 100% successful even, but instead it’s murky. It’s hard to find any controls. How do we control for surgery vs. no surgery? One idea is to look at 5-year survival and 10-year survival. If surgery is curing everyone at 5 years, there will be no deaths at 10 years, right? One prestigious source has 5-year survival at 61% and 10-year survival at 52%. So, 9% more patients died over the next 5 years. There is the issue of "competing mortality" however. I tried to zero in on any controlled study I could find. I found an older one, an imperfect study, that compared surgery to medical treatment in 124 patients total, and reported that only 3% who underwent surgery developed liver metastases while 23% who had medical therapy developed liver metastases. Presumably, preventing liver metastases also prevents death from cancer. Does this mean that surgery cures about 20% of patients? What needs to be done? There is a group of 211 patients who did not have surgery, who were stage 1, neuroendocrine, pancreatic cancer. If someone could go back and review their 5-year overall survival we could finally have a “historical” control group. This control group, or any other control group versus surgery, might turn everything we think we know about neuroendocrine pancreatic cancer upside down. Evidence-based medicine is done to remove biases and uncertainty about medical statistics. Removing biases, removing fiction from fact is why “blinded” randomized controlled trials are done. But, they are hard to do, and we often look to other controlled studies for help. We definitely need help with understanding the true treatment effects when it comes to pancreatic cancer. All of the benefit from surgery in the medical literature for stage 1 could be due to lead time bias. If you diagnose the disease earlier, in younger people than before, the 5-year survival will go up whether the treatment makes any difference or not. We see this false increase in survival all the time in cancer studies. I gave acupuncture a Treatment Score of NSD (No Specific Data). There are studies in human beings, but there are no studies specifically suggesting acupuncture increases 5-year survival for stage 1, neuroendocrine, pancreatic cancer. 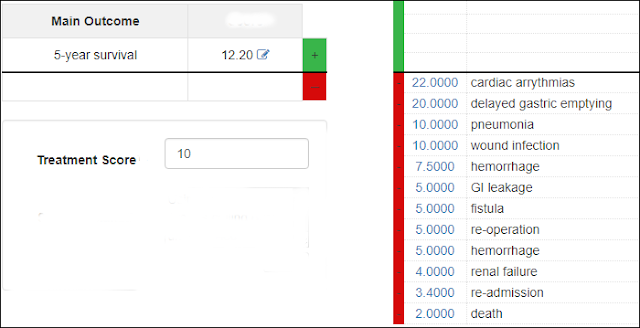 In our software, if you click on the Treatment Score, you can see the underlying references. You can verify the references, and you can see that none of them are directly applicable. I gave eating a fruit diet a Treatment Score of NSD (No Specific Data), because although there are human studies that suggest a fruit diet may act against cancers, there are no specific human studies suggesting a fruit diet increases survival for stage 1, neuroendocrine, pancreatic cancer. Hydrotherapy is “water therapy.” It is a form of alternative medicine, where water is used to treat pain or disease. 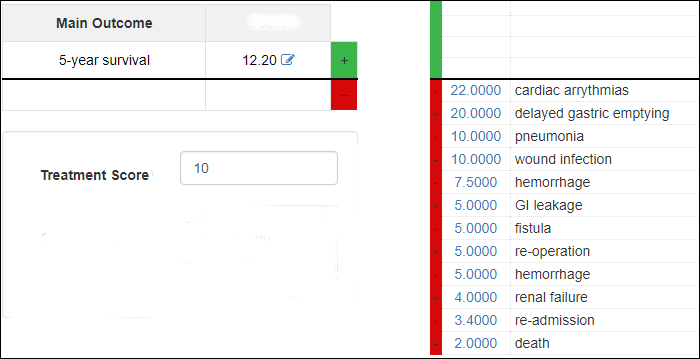 I gave hydrotherapy a Treatment Score of NSD (No Specific Data), because I did not find studies specifically about hydrotherapy increasing survival for stage 1, neuroendocrine, pancreatic cancer. As an aside, I do not “hate” alternative medicine. Far from it! I want all medical treatments to work, and to be proven to work, because that would be best for patients. Some alternative medicine treatments, herbs, therapies, and so forth do have good, or even great, medical studies supporting their use. I just want everyone to know what the existing medical studies say for every treatment, and for that information to be presented in an understandable fashion. I also want all alternative medicines that seem to work in the laboratory, or in mice studies, to go on to be tested in human beings in a safe and ethical fashion. I also understand why someone facing death would be willing to try an herb or supplement, when there are no good specific medical studies in humans, especially if that herb or supplement is known to be harmless, and inexpensive. Let’s make WHAT WE DO KNOW perfectly clear, and let’s always present the data in an easy to understand way. 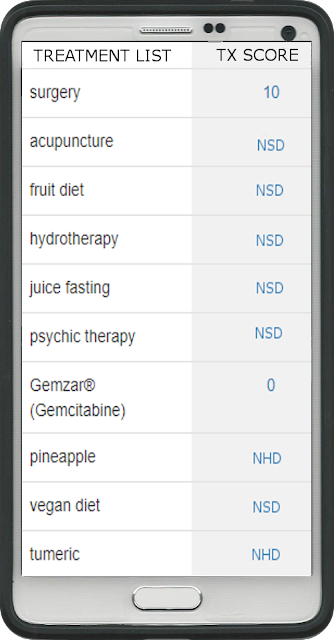 I gave juice fasting a Treatment Score of NSD (No Specific Data), because although there are human studies that suggest benefits, there are no studies that document a specific benefit for increasing survival in stage 1, neuroendocrine, pancreatic cancer. I gave psychic therapy a Treatment Score of NSD (No Specific Data). There were definitely not any studies showing a survival benefit for stage 1, neuroendocrine, pancreatic cancer. I thought coming up with a Treatment Score for psychic therapy would be fun. Instead, it was a bit of nightmare. There are studies and surveys using human beings, but everything I could find was very off-topic and tangential. I gave the chemotherapy, Gemzar® (gemcitabine), a Treatment Score of 0% for 5-year survival. It’s sad, because it is one of the few chemotherapy options. However, Gemzar® may have a positive Treatment Score if you use a shorter time period such as 1-year survival, or 1-month survival. That's a future essay. A businessman sent me an incredibly well-written, convincing, article about how pineapple cures cancer. When I dug into it, it was all based on a single laboratory study. Entire bodies of literature show over and over again why lab studies and animal studies do not translate well to human beings. I gave pineapple a Treatment Sore of NHD (No Human Data), because I could not find any human studies related to stage1 , neuroendocrine, pancreatic cancer that were relevant enough to use. There are some intriguing tangential studies with pineapple, or pineapple ingredients (bromelain), that have been done in the laboratory, so I would like to see studies done with human beings. There are studies that suggest a vegan diet might help prevent cancer. But I could not find any specific studies showing a vegan diet would help cure you once you already had this kind of pancreatic cancer. I gave turmeric a Treatment Score of NHD (No Human Data). There are some very interesting laboratory studies with turmeric, so I would love to see some human studies get done. Turmeric has an ingredient, curcumin, that is featured in many laboratory studies as probably having anti-pancreatic cancer effects. Studies in human beings need to be done. Wouldn’t it be a better world if there was a graphical user interface (GUI) over evidence-based medicine? Then, you could get a list of treatments and Treatment Scores for whatever you are diagnosed with. 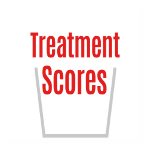 Our Treatment Scores system would help solve undertreatment, overtreatment, and mistreatment. It would educate everyone. What would Steve Jobs have done if all of this information had been organized and ready for him on day 1 of his diagnosis? The unanswerable question is: Would he still be alive today? Remember, 9 months went by between his diagnosis and his surgery. Did the cancer metastasize (spread) and become incurable during those 9 months? Who could blame anyone for taking some time to think before undergoing a major surgery? The problem is that it literally takes months to read all the studies, find all the medical statistics, and understand them. With Treatment Scores you can do all that in 10 minutes. It’s frustrating! The entire medical system should be geared toward figuring out the “net treatment benefit” for the patient, but sadly it is not. Let’s change this. 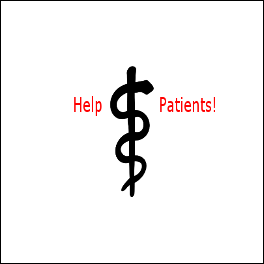 What would really be helpful would be a credible group of PhDs, doctors, nurses, and patients, who put patients first. We need people who are not working for Academia, Government, or Industry (or who declare their bias when they are), who produce Treatment Scores that are done transparently. That way we would not have to spend countless hours trying to understand medical treatments, and we could begin to solve the 88% health illiteracy problem. This essay is not claiming accuracy. It will be redone. It will be improved. Right now, it is for technique. It is about how we need to provide better treatment transparency to patients. The underlying data is highly uncertain (again, something that we will eventually show with animations). Most studies are case-series studies, which are considered low quality, and often are biased. Many assumptions have to be made. For example, I had to assume that surgery for stage 1, neuroendocrine, pancreatic cancer was somewhat similar to surgery for any stage or type of pancreatic cancer, but in theory surgery should be somewhat less risky when the disease is not as advanced. This essay is not medical advice. You must consult your own licensed physician for diagnosis, treatment, and for the interpretation of all medical statistics including Treatment Scores. Treatment Scores are for informational purposes only. Treatment Scores may be incomplete, inaccurate, harmful, or even cause death if used for treatment instead of consulting a licensed medical professional. No medical advice is being given. We (everyone, and every entity, involved in any way) DO NOT claim to cure, treat, or prevent any illness or condition. 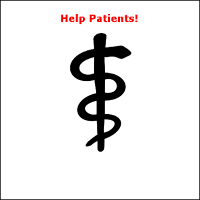 We DO NOT provide medical advice or constitute a physician patient relationship. Contact a physician or other medical professional if you suspect that you are ill. Call emergency services (911 if available) or go to the nearest emergency room if an emergency is suspected. We are not responsible for any delays in care from using our essay, website, our services, or for any other reason. We are not responsible for any consequential damages of any nature whatsoever. We make no warranties of any kind in connection with our writings or the use of TreatmentScoresBlog.com or TreatmentScores.com. Treatment Scores are about what happened to patients studied in the past; they do not predict the future. Cancer Research UK, (source for 1% survival statistic). Pancreatic Cancer Survival Rates, by Stage. Last Revised: May 31, 2016. J Clin Gastroenterol. 2002 Aug;35(2):180-4. The Pancreatic Cancer That Killed Steve Jobs, by Alice Park. TIME Magazine. The trouble with Steve Jobs, by Peter Elkind, FORTUNE, March 5, 2008. A Tumor Is No Clearer in Hindsight, by Denise Grady. Oct. 31, 2011. The early detection of cancer and improved survival: More complicated than most people think, by David Gorski, May 12, 2008. Turmeric spice could have cured pancreatic cancer that killed Steve Jobs, suggests oncologist, by Jonathan Benson. October 27, 2011, Natural News. Curcumin Induces Autophagy, Apoptosis, and Cell Cycle Arrest in Human Pancreatic Cancer Cells. Curcumin sensitizes pancreatic cancer cells to gemcitabine by attenuating PRC2 subunit EZH2, and the lncRNA PVT1 expression. Inhibition of Cell Survival by Curcumin Is Associated with Downregulation of Cell Division Cycle 20 (Cdc20) in Pancreatic Cancer Cells. Curcumin-Free Turmeric Exhibits Activity against Human HCT-116 Colon Tumor Xenograft: Comparison with Curcumin and Whole Turmeric. Trede M, Schwall G, Saeger HD. Survival after pancreatoduodenectomy. 118 consecutive resections without an operative mortality. Ann Surg. 1990 Apr;211(4):447-58. Department of Surgery, Klinikum Mannheim, Heidelberg University, West Germany. No mortality after 150 consecutive pancreatoduodenctomies with duct-to-mucosa pancreaticogastrostomy. J Surg Oncol. 2008 Mar 1;97(3):205-9. Murakami Y1, Uemura K, Hayashidani Y, Sudo T, Hashimoto Y, Nakagawa N, Ohge H, Sueda T. Department of Surgery, Division of Clinical Medical Science, Graduate School of Biomedical Sciences, Hiroshima University, Hiroshima, Japan. One hundred and seventy-eight consecutive pancreatoduodenectomies without mortality: role of the multidisciplinary approach. Hepatobiliary Pancreat Dis Int. 2011 Aug;10(4):415-21. Samra JS1, Bachmann RA, Choi J, Gill A, Neale M, Puttaswamy V, Bell C, Norton I, Cho S, Blome S, Maher R, Gananadha S, Hugh TJ. Upper Gastrointestinal Surgical Unit, University of Sydney, Royal North Shore Hospital, St Leonards, NSW 2065, Sydney, Australia. Laparoscopic Pancreatoduodenectomy in 50 Consecutive Patients with No Mortality: A Single-Center Experience. J Laparoendosc Adv Surg Tech A. 2016 Aug;26(8):630-4. Machado MA, Surjan RC, Basseres T, Silva IB, Makdissi FF. Department of Surgery, University of São Paulo , São Paulo, Brazil . Sírio Libanês Hospital, São Paulo, Brazil . Systematic use of isolated pancreatic anastomosis after pancreatoduodenectomy: Five years of experience with zero mortality. [214 patients] Eur J Surg Oncol. 2016 Oct;42(10):1584-90. doi: 10.1016/j.ejso.2016.05.023. Epub 2016 May 29. Machado MC, et al. Eur J Surg Oncol. 2016. Three hundred and sixty-eight consecutive pancreaticoduodenectomies with zero mortality. Oguro S, et al. J Hepatobiliary Pancreat Sci. 2017. Oguro S1, Yoshimoto J1, Imamura H, Ishizaki Y, Kawasaki S.
Department of Hepatobiliary-Pancreatic Surgery, Juntendo University School of Medicine, 2-1-1 Hongo, Bunkyo-ku, Tokyo, 113-8421, Japan. Here is a sample of acupuncture related URLs.